A geometric sans serif typeface based on the title screen of the 1959 film Plan 9 from Outer Space, superseded from Aero Matics. HarvettFox96 b1b5b5c2d9 Added 98 (unfinished) characters, six character tweaks, and updated five kernings. 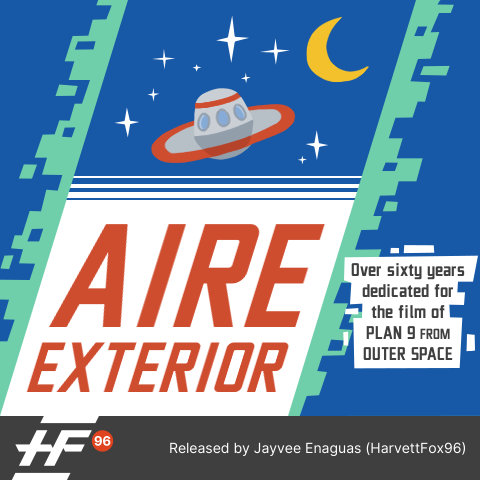 Aire Exterior (English: Outer Air) is a geometric sans serif typeface based on the title screen of the 1959 film Plan 9 from Outer Space, superseded from 2012 erroneous design Aero Matics, created with libre/free font editor software FontForge. See device specifications for more details on Wikimedia Meta-Wiki. See version release history for more details.